There are not many places in the United States that host international-level equestrian competitions, so if we even hosted one a year, Maryland would be fortunate. But the fact that Maryland hosts two international competitions within a week of each other is unprecedented—an autumnal cornucopia of equine athleticism. And for the first time in many, many years, both the Washington International Horse Show and the Fair Hill International were fresh and different, and our veteran attendees were delighted. 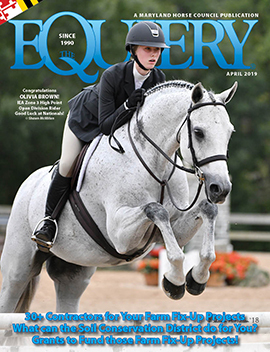 Maryland’s equestrians and Equiery readers, make up the core audience for both of these shows. Because they are horse people and because they are local, they will go back, year after year, no matter what—no matter how bad the show may be. Our readers are vocal and will be up front about what they don’t like. But they are also fair, willingly sharing what they enjoy. The local audience is keenly aware that both of these events need sponsorship to thrive, and sponsors needs to see lots of spectators in order to feel as if their investment was worthwhile. The Equiery’s annual review presents something of a progress report for organizers, reflecting the local audience’s perspective on the evolution of the Internationals. You, our readers, have made a difference in these events: Over the years, organizers have listened to you and have adapted. We hope you will continue to share with us your thoughts and impressions of the Fair Hill International and the Washington International Horse Show. The general consensus seemed to be that Fair Hill International outdid itself this year. As in recent years, the FHI organizers delivered top-notch competition with enough to keep spectators of all ages entertained. Despite the elimination of the combined driving, but perhaps because of the addition of a new two-star eventing competition, large crowds attended each day (no doubt, excellent weather also helped). And although the driving was certainly misssed, the dog agility, Pony Club games and a variety of demonstrations provided plenty of equine and canine sport. In December 2007, The Equiery wrote, “Everything seemed a tad more robust than last year. Even the landscaping seemed to have gone up a notch…” Well, FHI took its presentation up yet another notch this year. The Dansko sponsor tent had great displays and arrangements that made everyone feel they were at a high-class event. Every detail was in place, down to actual Dansko clogs once again used for potted plants. And once again, after our suggestion in 2006, trash was not a problem! The food court, vendor tents, etc., were all kept clean and tidy. Organizers have done a beautiful job creating a trophy presentation area. While it is challenging to try to please everyone, and while it is critical that the sponsors in the tent and the spectators in the stands see the awards presentation, the photographers were somewhat annoyed as they had to aim their cameras into the sun. The Equiery reported in 2007 that “spectators are not happy riding the free shuttle bus” from the parking area. Maybe people have just gotten used to the routine of the buses, but this year, everyone seemed content with the system. The kids’ area was filled with laughing kids obviously enjoying the spectacular weather and fun activities. Mike Dupuy’s new falconry demonstration was well attended and it was reported that he was a very engaging and entertaining speaker. In general, the staff and volunteers were very accommodating and easy to deal with. Veteran announcer Brian O’Connor did an excellent job and was easy to hear throughout the grounds. Well, this may be true, but you wouldn’t know that walking around the grounds all week! The addition of the two-star level is just what FHI needed to attracted more spectators and breath a new energy into the event. Attendance on dressage days and early Saturday morning was at an all-time high. With the two-star, the FHI might have found a way to underwrite its expenses without the traditional combined driving competition. With the addition of the two-star cross-country course, more of the event’s signature “critter” jumps were made by course builder Eric Bull. Some classics had migrated around the grounds, while others were missing—and missed. Where did the loons go? The “Big Blue Crab” at fence 13 on the three-star course was a fitting addition, speaking to the show’s Maryland roots. Ever wonder who decorates all those jumps? Well, Judy Thayer and John Ryan led a huge group of volunteers through weeks of planning and setup to produce those fabulous fences. Resident artist Fran Loftus added the color by painting all the silhouette figures and animals on and around the fences. Together, the final presentation adds something special to the FHI experience. Last year, The Equiery applauded FHI for its “beefed up” vendor area and “truly international” variety of booths. This year, however, the variety and number of vendors were sorely lacking. Whether it is today’s economy, the price of gas or just lack of interest, shopping was definitely down, despite the perfect weather helping to provide a boost in the gate. The location of the vendor tent may contribute to this conundrum of more spectators attending but fewer shoppers shopping. Upon arriving, spectators are immediately greeted by a small grove of trees and a “fork in the road”: They can go right to the dog agility trials, or left to the horse competition areas. They will go through the vendor area to get to the horse competition, but if they don’t seek out the horses, they won’t bump into the vendors. As for the dog handlers, who enter the grounds even farther away, they have even less awareness of the food court and vendor area (but are delighted to find it if they stumble upon it). In a perfect world, the vendors and food court would be the exact center of the two animal competitions, but that is impossible given the lay of the land and the grove of trees. Perhaps there is some other way to tweak the flow, to somehow bring the main vendor tent closer to the main gate, to rotate the vendor entrance, to ensure that there are no vehicles blocking visual access, put the splashiest and flashiest and most colorful vendors with the most eye-catching displays angled so as to catch the attention of those hanging out on the “right,” the dog agility side. Maybe organizers could hold a “meet and greet” wine and cheese party in the vendor area for the dog people and the horse people on Thursday evening. A little music and free food can do wonders, but maybe there could also be some sort of fun “hook” to increase inetraction between the dog and horse people. The food vendor court, however, continues to offer a variety of quality food not found at your average horse show or horse trial. And the “Pub” being open well past the end of the competition day allowed for spectators to hang out, discuss the day’s rides and just enjoy FHI well into the evening. This year’s event program had a new look. While the smaller size was easier to tote around, some things were harder to read. The smaller format doesn’t do justice to Fran Loftus’ lovely fence illustrations. The diagrams to show spectators options at fences were also were squished. An extra page between the two- and three-star illustrations would also be helpful since, as it stands, the two courses almost read as one course. Maybe an extended fold-out center map is do-able. Or just zoom in on the current map, cutting out woodlands not used for the courses. For the illustrations, spread them out over more than the current eight-and-a-half pages to allow for larger pictures. Yes, this does mean a thicker program with more pages, but hey, sell more ads and the cost is covered! Other than that, all the relevant information necessary for spectators is included in the current format. Although advertising for the event in local papers, on the radio and on television continues to be great, one important part of this year’s competition was missed. Apparently, 2008 marked the 20th anniversary of the FHI competition! Who knew? A small celebration was done between the two- and three-star show jumping rounds, but other than that, only one line in the program even mentioned this important accomplishment. Well, the 25th anniversary is just around the corner. Maybe FHI will have JumboTrons by then! In theater, there is an ethos that—no matter what—one should never let the audience know what goes on in the wings or backstage. There may be complete chaos backstage, but even if this chaos causes flubs on stage, it is imperative for the actors to keep the show moving forward, not to break character, not to acknowledge flubs, to just keep going—and the audience never knows the difference. Washington certainly had that kind of backstage chaos this year, bringing in entirely new management mere months before “opening night,” for both the business and the show sides of the event. A brand new executive director, new marketing firms and new show management were supported by some remaining administrative support, vendors (such as announcers) and suppliers. And while there was sometimes confusion and scrambling backstage, the show on stage moved briskly along with nary a bobble. A tip of the cap to the new executive director Debbie Blair (formerly with Breeders’ Cup Limited) and show managers David Distler and Robert Ridland. In addition, a nod to all the staff, from the administrative staff to the marketing and PR staffs to the show management staffs, is warranted. Everyone was cheerful and delightful to work with. Nifty at 50: Celebrities, Sequins and Sass! Washington did offer a “Celebrity Hunt Class.” While certainly not the glittering Hunt Night from days of yore, with hordes of local foxhunters impeccably turned out both in the arena and in the party lounge, the Celebrity Hunt Class on Thursday night, which featured teams made up of Olympians and World Champions in hunters, jumpers and eventing, was a ton of fun to watch and the crowd really got into it. “Legends only need apply” should have been the moniker, and the crowd delighted in watching such fan favorites as husband-and-wife Olympians and eventers Karen and David O’Conner, along with Nina Fout, negotiate a classic field hunter course gracefully and synchronize their tandem jumping. Former Marylander David O’Conner’s on-the-neck bobble caused wife Karen to shake her head while the crowd let out a collective wail. The Equiery’s veteran correspondent Gwyn Donohue writes, “The star of the class was 81-year-old show jumper Harry deLeyer (see sidebar). His ‘Legends’ team of Louise Serio and Sandy Ferrell strove to impress with formal foxhunting attire and a bugled ‘call to the hounds’ before their start. The consensus: Celebrity Hunt Night was fun and different; we hope Washington will continue to offer similar “celebrity” classes, be they hunt nights or barrel racing, on Barn Night. Washington could make the “celebrity” classes even more meaningful by asking these world champions to stay for autograph signings at the conclusion of the evening, when the Barn Night participants are invited into the arena to walk the course. Another tip of the cap to show organizers, striving to please their core audience, the local horse people, for they once again delivered. Writes Donohue: “American Saddlebreds, last seen at the WIHS in 1972, were brought back for the 50th anniversary. Television celebrity Carson Kressley of Bravo’s ‘Queer Eye for the Straight Guy,’ presented the colors in a red, white and blue sequined outfit that would easily qualify for ‘What not to Wear’ if worn outside the show ring. And once again, the crowd loved it. The mere fact that the “Saddlebreds were back” brought in more ticket sales on Friday night, with a crowd just as fabulously turned out as those in the ring. Like the old days of Washington, we saw gowns, black ties and fur coats. What fun! Other than dubbing the usual Saturday night party the “alumni party,” there was very little attempt to really play up this year’s show as a grand reunion. WIHS staff reached out to some “alumni” by “invitation only,” which is ridiculous considering the thousands of people who have shown at Washington over the last 50 years, and no one has a database that captures all of those people, their new addresses, their new names. There were absolutely no public attempts to attract alumni via special seating, package prices or alumni party access. No information available on the website, advertisements geared to alumni. Nothing. Washington, unfortunately, missed a one-time opportunity to re-engage thousands of people with the show, fill seats and create new and future sponsor relationships. What a shame. Small attempts were made to recognize a few people from the past. Betty Oare, a true doyenne of the hunt seat show world and one of the first WIHS champions, was trotted out to judge and provide color commentary for Celebrity Hunt Night. Prior presidents of the Board of Directors were paraded in the arena on Friday evening and thanked for their years of contribution. Edna Lytle and Sheila Heider, exhibitors at the first Washington in 1958 and grand dames of the show hunter world, received a thank-you in the show program for the day they spent in the Washington offices (at the invitation of The Equiery) plowing through photo archives to help both The Equiery and WIHS identify people and horses in old photos. But other than a few trinkets from WIHS and a nice note in the program, they received no special invitation to anything. Because there was nothing. Horse shows, of course, are about the horses, but it is the horse show PEOPLE who breathe the life into a show and make it real, year after year. How wonderful it would have been to have reached out to all those thousands of people who have ridden in that spotlight over the last 50 years, done something special for them—reached out and encouraged them, in some creative way, to attend and once again be part of the show. Perhaps this lack of alumni offerings was a casualty of the abrupt and last-minute change of administration mere months before the show. Or perhaps it is a reflection of the lack of vision on the part of show leadership. Whatever the cause, it was a shame. Maybe if the show makes it to its 75th anniversary, it will rectify that. We’ll keep you posted! What Did WIHS Do To Celebrate? In addition to some of the individual recognitions mentioned above, the program featured a 10-page timeline of delightful photos, newspaper clippings and factoids, which was enjoyable for those willing to pay for the program. During the show itself, an astute concourse walker might have spied a couple of display cases filled with historical show mementos, but as the cases were not really played up, they were easy to miss. The same anniversary montage was played on the JumboTron several times each night with no real new information or facts given (unlike the program, which did provide context). The website is more paltry than the JumboTron montage. Hands down, the best nod to the show’s 50th was the show program, which is sure to become a collectors’ item. Enough about the anniversary. How did this show rate in and of itself, and in comparison to prior years? One aspect in which WIHS excelled this year was the quality and variety of demonstrations that were showcased. World Champion combined driver Chester Weber wowed the audiences on Friday and Saturday with his four-in-hand horses. He explained the sport of combined driving in a clear and energetic way that really impressed all who watched. As we noted earlier, the Saddlebred exhibition Friday night was also a huge success. Many of today’s WIHS spectators don’t remember the days when gaited horses were part of the actual competition, so this exhibition gave a great view of a lost WIHS class. Washington always has at least one act with an “Awww, how cute!” factor. This year it was “Big and Little,” where eighth-generation circus performer Caroline Williams put two beribboned stallions, a massive black Friesian and a Thelwell-like mini, through a trick routine at liberty. A time-honored class with a new spin opened Thursday evening’s performance. Disappointingly, the WIHS Dressage Invitational, which enjoyed a successful run from 2005 to 2007, was not held this year. Dressage enthusiasts still got their fix, however, with an exhibition by Canadian Ashley Holzer riding 11-year-old Pop Art, her 2005 and 2006 Invitational champion Dutch warmblood. What is notable about this year is not one single demonstration fell flat, which is quite an accomplishment! In terms of the actual competition, as usual, the quality of the horses and riders was outstanding. Although entries were lean for both the Gambler’s Choice and the Puissance, the audience did not seem to mind, as it kept the evening moving. Friday evening’s show was fun and filling, yet ended early enough for those who wanted to enjoy a little of the city nightlife or those who needed to get home to get up early to feed or make it to Opening Hunt the next day. Veteran Gambler’s Choice fans were a tad disappointed in this year’s class, however. The fact that each competitor rides the course differently is what makes this class so much fun for the spectators. This year, riders seemed to choose depressingly similar tracks, making the class not that much different than an ordinary jumper class. Perhaps something for the course designer to consider for next year? And who can miss that stunning JumboTron? Debuting during the 2007-2008 season and reportedly one of the most expensive arena high-definition LED scoreboards in the country, the it provided stunning, up-close view of the action. Better than front-row seats, the JumboTron made you feel like you were sitting in the arena—no matter where you were in the stands. Organizers did not attempt to bring back musical entertainment this year. No marquee country singers, no Motown wonders, no teen pop queens. And no one seemed to miss it. A tip of the cap to WIHS organizers. It made a huge difference to have a local firm dedicated to the local media, with aggressive radio advertising and much more consistent coverage in The Washington Post. Cute “made-for-local T.V.” stunts, such as a 7th Street lunch for the horses, helped WIHS secure screen time. From the website to ticket sales, finding information about WIHS was made very easy this year. We do wish, however, that organizers would post all press releases on the website and make them easier to find. Just like FHI, vendors were fewer at this year’s WIHS. Some felt that the selection of vendors present was a letdown from years’ past. There were far fewer actual tack or riding oriented vendors and those that were there had very high prices. For the non-horsey person, there was plenty to choose from with all the fine jewelry, artwork and clothes—but only if you were willing to drop some coin, which in this economy, not many are willing to do. The food inside the Verizon center was also expensive, and there was not much to choose from. Outside, however, the downtown Gallery Place area is hopping with great restaurants and bars, many of which were filled with WIHS spectators before and after the show. This year, WIHS partnered with Autism Speaks—and they nailed it. It’s an excellent charity, it brings everything to the table that WIHS needs in a charity partner, and the results were evident. We hope that this is the beginning of a longterm relationship with this charity, in order to make the most of the partnership for both organizations. Bravo! DeLeyer is best known as the owner and rider of Show Jumping Hall of Fame horse Snowman. A Dutch national, he immigrated to the U.S. after World War II and was making a sparse living on Long Island teaching children to ride. In 1956, he bought the 7-year-old plow horse for $80 off a truck bound for the dog food plant after an auction. He first used the gentle giant for lessons, but after selling him to a neighbor, the horse jumped every fence they built to return to deLeyer’s barn, and he recognized he had something special. Just two years after the auction, Snowman earned the title of American Horse Shows Association Horse of the Year, winning it again in 1959. He became an instant celebrity, even appearing with deLeyer on the “Johnny Carson Show” and making international appearances, as well. He was known for his calm disposition and incredible athleticism, and once won a leadline class and an open jumper championship on the same day. DeLeyer never sold Snowman, even after receiving then-unheard-of six-figure offers for him. The horse spent his last days on the deLeyer family farm in New York, dying peacefully at age 20. DeLeyer went on to a prestigious career, training up-and-coming show jumping stars and competing into his late 70s. He continues to keep busier than most people half his age, as a course designer, a pony breeder, a volunteer with Amaryllis Farm Equine Rescue in Southampton, New York selling show jumpers, and more. Before the “Galloping Grandfather” left the Verizon Center arena, he exchanged cards with McLain Ward. He had a horse to show the 2008 Olympic gold medallist.